This is what it says in a haunting typeface on the back of the Dark Souls’ case. While many developers choose to imprint encouraging words of solace on the back of the box, From Software decides to boldly state the worst thing you could think of, possibly stave off potential gamers, or, on the other hand, pique the curiosity of one. But that’s Dark Souls – it does things the hard way, the incredibly difficult way. Before getting into the game there is a fact you have to face and come to terms with; you will die countless times playing this game no matter how skilled of a gamer you are. There is no avoiding it. And the reasons are simple. It’s fun and satisfying. Yes, it may be difficult, it may be frustrating, but once you finally clear an area and once you finally beat a boss that has killed you, three, four, eight times, you will feel like you have actually achieved something. It’s a feeling that most modern games lack. The fighting mechanics add a great deal to the game: button mashers will be punished, a person with a more patient, strategic approach will be rewarded. If the fighting mechanics were off in some way, this game would probably be boring and broken, but they’re not and they’re easy to get a hang of. There are a few things that add quite a bit of depth to the game. First off, when you start a new game you can choose from multiple classes that you would typically find in a role playing game, giving you multiple ways to go about playing the game. Weaponry also adds a great deal of depth to fights – there are countless of different weapons that attack differently and have different effects, you don’t want to be swinging that great sword in that narrow corridor, your enemies will take advantage of that. The game instills this feeling of anxiousness as you play, especially when you don’t know what the next room or open space holds. 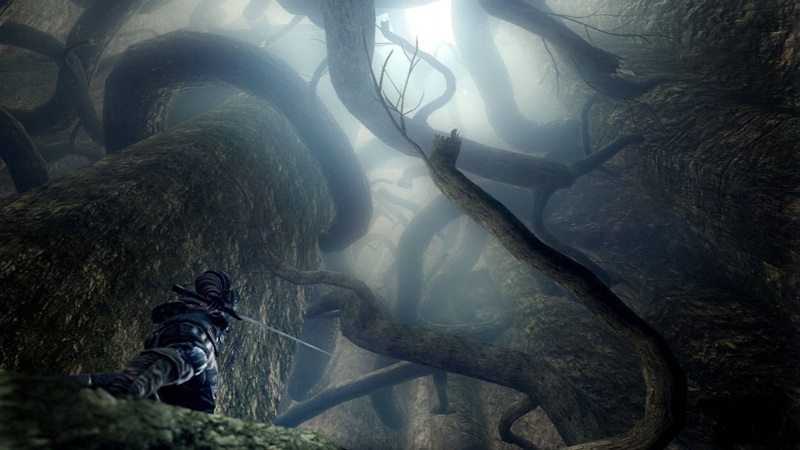 I remember exploring a very beautiful, serene forest only to come upon a giant piece of armor on the forest floor. I went to get a closer look, thinking it was a relic of the past only for it to come to life and I came face to face with an iron giant that demolished me with its giant sword. The world of Dark Souls is gorgeous. One of the first areas you can explore is this cavern that holds a massive lake. It’s a very tranquil but haunting area. You’ll come across some very breath-taking scenery as you fight your way through the game. I fought my way through a castle filled with the undead before reaching a spectacular view of a valley with the sun shining through some dark clouds, but even underneath that glorious sun, I still felt uneasy, knowing there was bound to be a difficult fight coming up. Despite this, I wanted to push forward – to explore the world some more and to discover what lay ahead. The game will give you little to go by. Tutorials are kept to a bare minimum, there are no directions on where to go or what order to do things in. Just hints – leaving you to explore the open world on your own. You can go anywhere you choose, but you’ll be punished for venturing into an area that you’re not prepared for. When you kill enemies, you collect Souls which is basically the currency and experience points that you can use to level up your skills or buy/upgrade your weaponry and armor. It’s not necessary to do so, but you can make things less challenging if you choose to grind as you play. It’s not necessarily a tedious, boring affair since fighting in this game is entertaining. The game also features quite a unique and interesting online component. 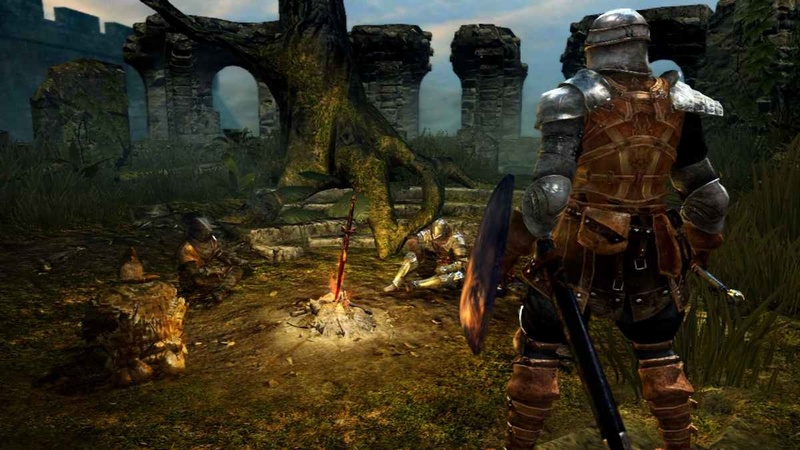 As soon as you start your Dark Souls adventure, you’ll be connected to everyone else who is playing the game. You’ll see messages left by other players, either warning you of danger, pointing out a secret treasure or even trying to trick you into thinking you’re safe. While you play the game you’ll see “phantoms” running around – these are actually players, going through the area you’re in. You’ll run across bloodstains on the ground that you can interact with and can view how the player who left the bloodstain died. You can also summon players if you need help, or choose to be summoned if you feel helpful. On the other hand, you can invade (or vice versa) another players world and kill them for their souls. I believe one of the reasons I got attached to this game is because it reminds me of Castlevania. I would consider this a spiritual successor to the 2D Castlevania games – from exploring a magical world to the gigantic, epic boss fights. Dark Souls is a gripping intense experience that will have you come back for more. It will urge you to discover more about the world it’s set in, and you will feel a powerful urge to beat that boss. It’s a beautiful, haunting game that deserves the recognition it’s getting from the gaming community and should be a strong contender for Game of the Year. This entry was posted in Microsoft, Playstation 3, Sony, Trailers, Videos, Xbox 360 and tagged 360, Dark Souls, From Software, Fun, Microsoft, Playstation 3, ps3, RPG, trailers, Video games, Xbox 360. Bookmark the permalink. I’ve had this damn game since release, haven’t bought any other PS3 games since and I STILL haven’t beat it. I platinumed Demon Souls and I love it, that’s not the issue. It’s just so punishing, you’ll ram yourself against the same sequence for an hour before you beat it and then you cruise through the next 3 hours then hit another wall. It also definitely demands a LOT of attention – you have to be alert and careful the entire time you play and honestly it gets exhausting 😛 Sometimes you just want a dumb game you can relax and watch cutscenes in. Also because of the open world nature you can get lost for hours in the world just exploring places you aren’t supposed to be in yet and finding weapons you shouldn’t have yet. That said it’s probably my GOTY 2011, but it definitely is not for anyone.